Former Fulham and Real Sociedad boss Chris Coleman has been appointed manager of Greek side Larissa. Coleman has the job of getting the former Greek Super League champions back into the top flight after their relegation from the top flight. The Welshman has signed a one-year contract at the club, with the option of extending it by a further two years. Coleman takes over from Nikos Kostenoglou, one of three coaches at the helm for Larissa last season. The club began the campaign with Marios Ouzonidis in charge but replaced him with Jorn Andersen, who lasted just 24 days before Kostenoglou failed to steer them to safety after his appointment in January. 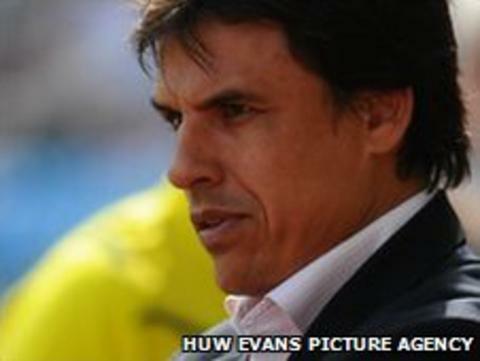 Former Wales captain Coleman started his managerial career at Fulham in 2003 before moving to Real Sociedad for one year in 2007. The 40-year-old's last job was at Coventry, where he was sacked after the Sky Blues came close to relegation during his two seasons in charge.